The modern-era traditional Latin Mass in the Diocese of Knoxville dates back to early 2004 when then-Bishop Joseph Kurtz granted an indult giving the special permission then required for celebration of the older form of Mass, and invited priests from the FSSP parish in Atlanta to commute to St. Stephen Church in Chattanooga, whose then-pastor Fr. 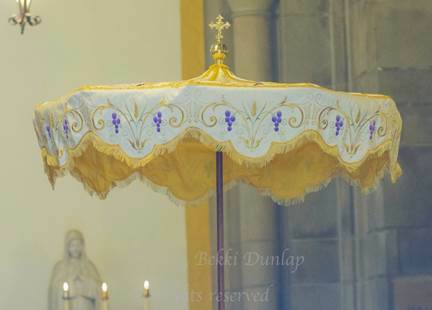 P. J. McGinnity generously offered to host a monthly 5 pm Sunday TLM there. On July 7, 2007 Pope Benedict XVI issued motu proprio the historic Apostolic Letter Summorum Pontificum that returned the ancient form of the traditional Latin Mass to regular status in the Church’s liturgy in order to foster “an interior reconciliation in the heart of the Church”. Fr. Dowling responded promptly by scheduling a regular weekly 1:30 pm Sunday Latin Mass at St. John Neumann Church beginning with the actual implementation of Summorum Pontificum on September 14, 2007 (click here for photos of that first weekly TLM in Knoxville). After the old SJN church was closed and while the new SJN church was under construction, this weekly 1:30 pm Sunday Mass was transferred to St. Therese Church in Clinton where Fr. Orr was then pastor. In April 2008, Fr. 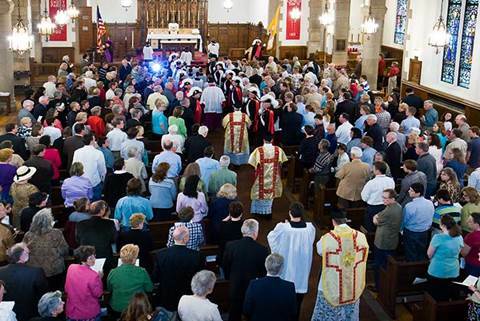 Xavier Mankel generously agreed to host our first solemn high Mass with an overflow attendance of about 475 during the centennial celebration of Holy Ghost Church (photos here). When the Most Rev. Richard F. Stika was appointed as Bishop of Knoxville, he appointed Fr. Orr as associate pastor of Holy Ghost and moved the Knoxville Latin Mass to Holy Ghost Church, where Msgr. Mankel as pastor graciously added our 1:30 Latin Mass to the parish’s regular Sunday schedule, its Sunday morning Mass schedule having been set in concrete—as literally inscribed on the church’s foundation stone—since the present church was built in 1926.
cards and altar linens), candlesticks, processional torches, bells and thuribles, etc. 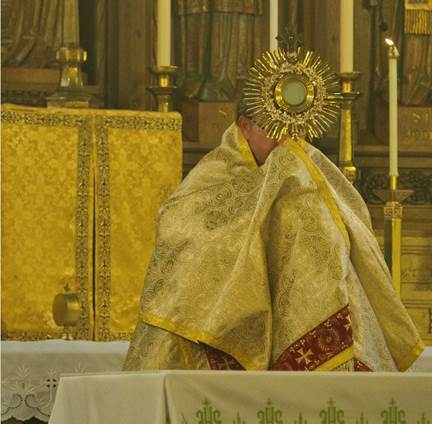 For example, the costs of our several 13-piece solemn high Mass vestment sets in the various liturgical colors (gold, white, red, green, and black) ranged from about $5,000 each to somewhat more than that, with a comparable expenditure for additional requiem Mass furnishings including a black funeral pall and standing floor candlesticks; our ombrellino for Eucharistic processions and our gold altar crucifix cost around $2000 each; an altar missal or a set of 6 large altar candles may cost $500, and so forth. 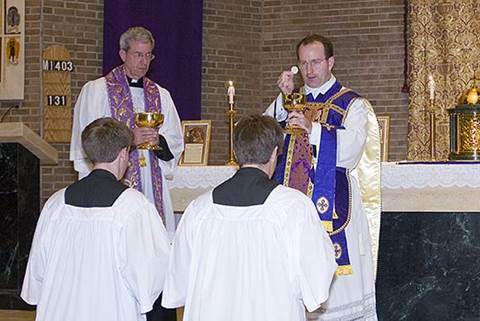 The value of the total property inventory of the Knoxville Latin Mass Community (KLMC) is somewhat more than $50,000, and its annual budget had typically totaled $20,000 or so. 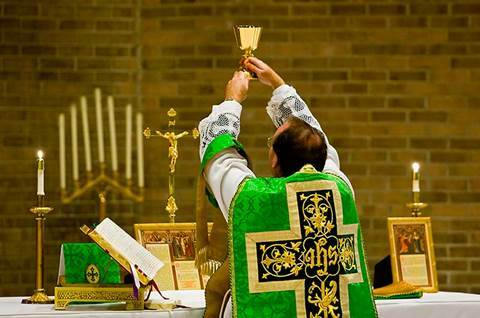 The KLMC assisted in the formation of the Tri-Cities Latin Mass Community (TCLMC) which supports the Latin Mass at St. Mary’s Church in Johnson City, and the KLMC budget includes the TCLMC budget since the Knoxville Community handles also the financial affairs of the Tri-Cities Community. Click here for a brief statement of the Community’s general purpose and goals. 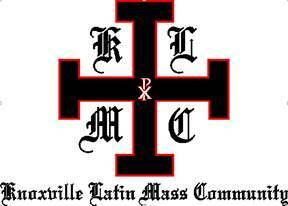 The Knoxville Latin Mass Community (KLMC) is incorporated as a non-profit organization under the laws of the state of Tennessee and is approved under IRS section 501(c)(3) for receipt of tax-deductible contributions toward the support of the traditional Latin Mass in the Knoxville area. The KLMC operates in accordance with its charter and bylaws under the oversight of a Board of Directors which elects officers and new members as needed.